That theme of cooperation, including striking a balance between consumption and conservation, quickly rose to the surface Friday, as members of the whitewater, conservation and political communities met at Colorado Mountain College in Glenwood Springs to discuss the future of state water policy. A benefit of the state effort is that many interest groups have gotten together to discuss the issue, creating new partnerships that before may never have been possible, said Kristin Green, Front Range field manager for Conservation Colorado. More than 24,000 comments have been made concerning the draft water plan, and the public comment period doesn’t end until Sept. 17, Green said. She noted that the second draft of the water plan begins to delve into potential solutions, and suggests a conservation goal of saving 400,000 acre feet by 2050. It’s the start of establishing the criteria officials may want to discuss, she said. Lewin said that while the Roaring Fork River may be a small component of the overall Colorado River Basin, it still contributes around 1 million acre feet of water to the larger river each year. She said the quality and quantity of that water can be very significant farther downstream in both an ecological sense and for its value to industries, municipalities and agriculture. But diversions strain that resource. “Having high-quality water in the Roaring Fork makes a big difference of the water quality overall in the Colorado,” Lewin said. She added that the river’s gold medal fishing designation is a huge economic boost to the valley. That lofty standard is met when there are at least 60 pounds of trout per acre of water, including at least 12 fish that are 14 inches or longer. These conditions occur when a river or stream consists of clean water, and is home to an abundant insect population and a healthy riparian area. Lewin said surrounding riparian areas provide shade to cool river temperatures; food for aquatic creatures; erosion control; and help to filter pollutants. Lewin said the recent wet spring led to the term “miracle May,” a month with a huge amount of precipitation that helped make up for a dry and warm winter. The heavy flows also helped to clear out sediment that built up in areas of the Roaring Fork. Lewin added that old oxbows in the North Star Nature Preserve east of Aspen were again filled with water this spring, putting the wetland area in a more natural state. The Roaring Fork Conservancy has also engaged residents in the Crystal River Valley to work on addressing low stream flows. That effort has focused on looking at best practices to manage diversions and return flows, and studying the area’s physical features. “We’re trying to see if we can use all of those pieces together in cooperation with the people who live on and around the river, and use that water to do the best we can for the Crystal,” Lewin said. Dean Moffatt, a local architect, inquired about efforts to bestow the federal “Wild and Scenic” designation and its protections on the Crystal River. Aron Diaz, a Silt town trustee, said there’s a lot of interest among local leaders in the Colorado Water Plan. Diaz said the biggest point of concern is that Front Range basins are still adding placeholders, indicating that they may need more West Slope water to meet demands. HB15-1167 is up for hearing tomorrow in the House Agriculture, Livestock, & Natural Resources committee. The bill is the brainchild of J. Paul Brown representing District 59 down in southwestern Colorado. It would direct the CWCB to study the feasibility of new mainstem storage on the South Platte River downstream from Greeley. It also directs the CWCB to utilize existing studies of the possibility of pumping water from the Missouri River Basin back to Colorado. I suppose he’s talking about the USACE’s alternative to Aaron Million’s pipeline from the Green River or the Kansas Aqueduct project. The bill calls out the Narrows Dam Project (650,000 AF) that was authorized by the US Congress but never built for a number of reasons, most of which would be faced by any new mainstem project. Senator Sonnenberg shows up as the Senate sponsor. My time in the legislature is challenging and exciting. I am working hard on my bills as well as keeping up on my committee bills and the bills that come to the floor. I actually have a little advantage over other legislators in that my apartment is half a block from the Capitol, so all of my time, when I am not sleeping, showering, or attending receptions, is spent reading and preparing for action on bills. 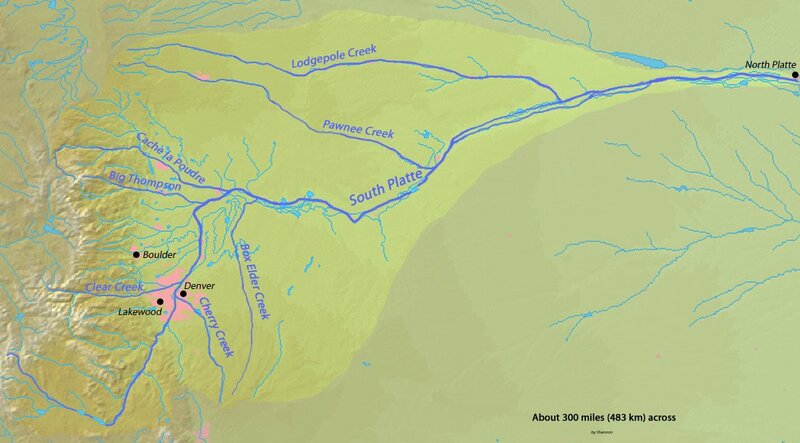 My number one issue is water storage and primarily storage in the South Platte drainage in Colorado. Why on the South Platte? Because that is the one drainage on the eastern side of Colorado that regularly has water that leaves the state that can legally be stored and used in Colorado. When I was in the legislature in 2011 and 2012 I started paying attention to the water in the South Platte Basin that was leaving the state. 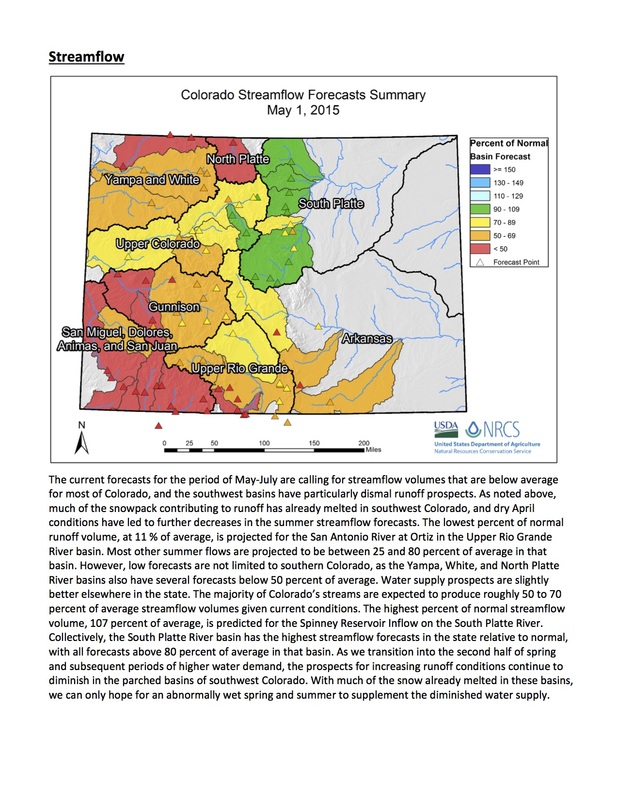 There were two years in particular where over 1,000,000 acre feet per year were wasted, another where 600,000 acre feet left the state, and even today there is excess water running out of the state that could be used to augment other water needs in Colorado. If we could store that water, it would help to satisfy the demand on the Front Range and relieve the need to send water from the Western Slope to the more populated Eastern side of the Continental Divide. For the past many years I have been learning all I can about water, water law, water compacts with other states, and everything else related to water that I could possibly learn. I started at a young age when my parents were paid to measure the water at the Colorado/New Mexico state line on the La Plata River South of Hesperus, Colorado. On most early mornings before I caught the bus for school I would measure the amount of water in the river. That information was then relayed to the water authorities in both states where ditches were closed or opened depending on their priority. I have monitored Governor Hickenlooper‚s „water plan‰ and have attended as many Water Roundtable meetings as I could possibly make. I have attended the Colorado Water Congress meetings amongst the most knowledgeable water lawyers and providers in Colorado. Everywhere I go I have asked folks about storage on the South Platte. The more I have learned, the more it became evident that all of the information needed to make good decisions on where and how to store water was scattered in many different places. I decided that it was necessary to pull all of that information together and that the easiest way to do so is to run a bill. That bill is HB15- 1167. It will be heard in the House Agriculture, Livestock, and Natural Resources Committee upon adjournment on the 18th of February. More 2015 Colorado legislation coverage here. 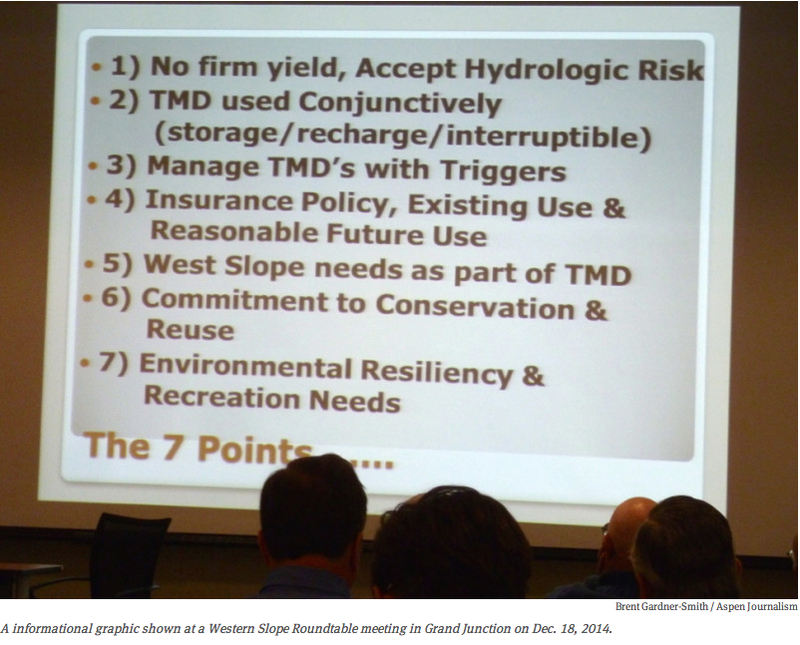 A draft seven-point framework that lays out conditions for a potential new transmountain diversion in Colorado was explained Thursday in Grand Junction to the members of four Western Slope water-planning roundtables. About 75 members of the four roundtables heard Bruce Whitehead, a member of the Interbasin Compact Committee, describe in relatively plain terms a “draft conceptual agreement” the committee reached in June on how to possibly move more water from the Western Slope to the Front Range. The 27-member Interbasin Compact Committee serves as something of an executive committee for the nine basin roundtables. Its mission includes developing new water storage and providing a framework for negotiations between the roundtables. The Colorado Water Conservation Board, the state agency charged with planning for the state’s water needs, oversees both the committee and the roundtables. Members of both the Colorado River Basin and the Gunnison River Basin roundtables recently expressed dismay that a perception had been created that an agreement on a new transbasin has been reached. At their November meeting, the Colorado roundtable members unanimously adopted a motion stating that “it would be premature and inappropriate” to include the seven points in the Colorado water plan. 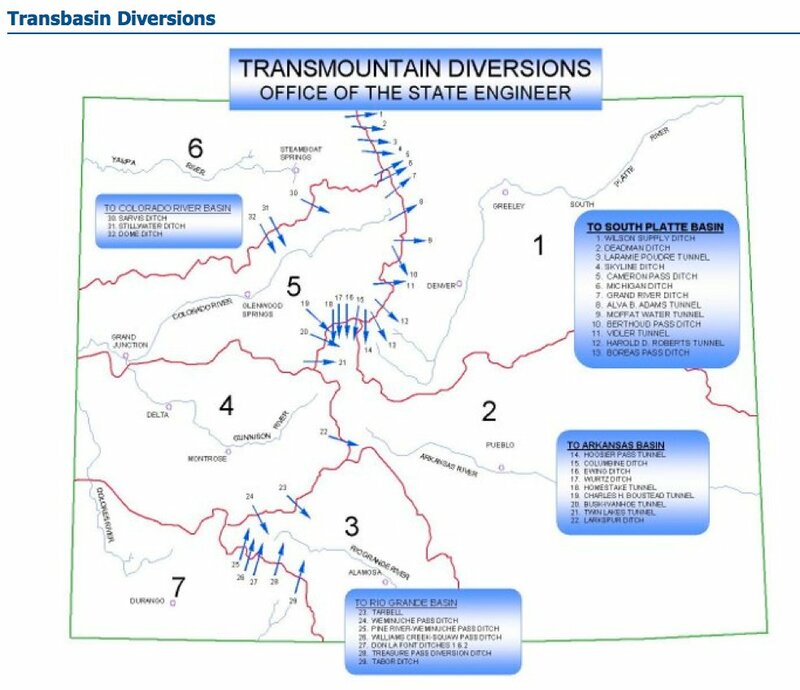 Whitehead said the third point, concerning “triggers” that might force a new transmountain diversion to divert less water, was about managing a potential “compact call” from California and other lower-basin states. Such a call could force junior water-rights owners in Colorado and other upper-basin states to stop diverting water. The fourth point calls for an “insurance policy” for existing junior water rights, and raises the question of how much more water should be diverted from the state’s west-flowing rivers in the face of a looming compact call. Most of the basin roundtables are set to meet in January, and the Interbasin Compact Committee, which has not met since June, is slated to meet Jan. 28. A final version of the Colorado water-supply plan is due in December 2015. 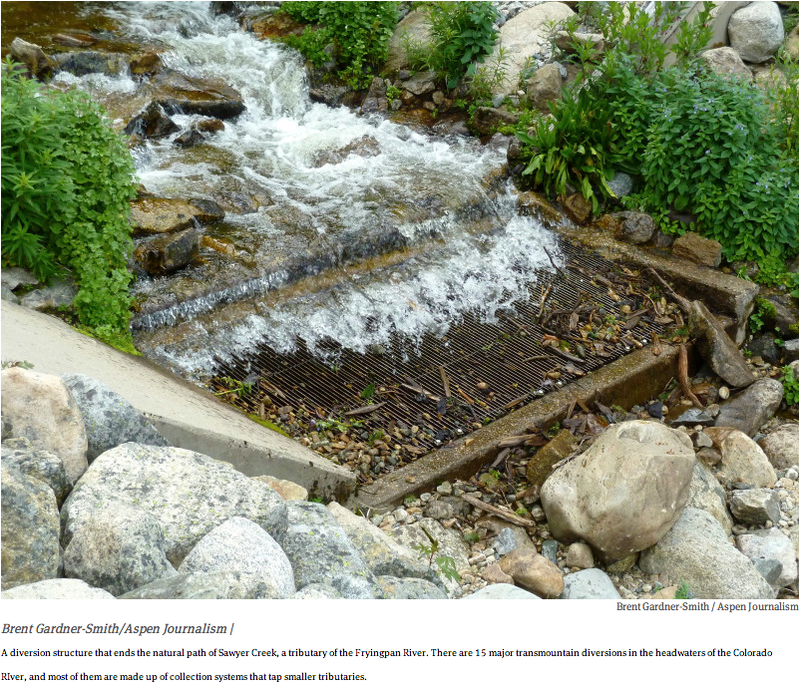 Editor’s note: Aspen Journalism and The Aspen Times are collaborating on coverage of rivers and water. The Times published this story on Monday, Dec. 22, 2014. Climate change might not be the end-all, be-all in the state’s water discussion, but Brad Udall knows it needs to at least be a part of it. “The proper way to deal with climate change is to get out of the scientific battles and deal with it as a risk,” said Udall, who is the director and principal investigator of the University of Colorado-National Oceanic Atmospheric Administration Western Water Assessment. While Colorado isn’t dealing with what Udall says is the biggest climate change impact, sea level rise, it is dealing with impacts of the overall water cycle. The West faces an unprecedented 14-year drought, resulting in low water levels at Lake Mead and Lake Powell, supply-demand gaps, power losses and threats to conservation. As the atmosphere warms, it also holds more moisture, resulting in water cycle changes. Udall said the effects are already appearing as more rain and less snow, earlier runoff, higher water temperatures and more intense rain. The higher water temperatures are something that water conservation folks throughout the Western Slope are concerned about. At a recent Colorado Basin Roundtable meeting, Holly Loff, executive director of the Eagle River Watershed Council, introduced to the group a recent assessment of the Upper Colorado River. The study shows that elevated water temperatures are occurring in the Upper Colorado that are above the known thermal tolerance of trout. Loff said more transmountain diversions out of the basin to the Front Range would only further affect aquatic life, which goes beyond just fish and bugs. Loff said she isn’t so quick to join in on the finger-pointing to the Front Range. The Front Range has cut back on wasteful bluegrass lawns, for example, and is doing a great job in terms of per-capita water use. [Martha Cochran] points out that agriculture efficiencies could help improve water supplies, but the use-it or lose-it concept hampers progress. Use-it or lose-it means that a water user who fails to divert the maximum amount of water that their right allows loses some of their rights the next time they go to court to transfer those rights. As the state crafts the Colorado Water Plan, one development holds out hope that East and West Slope entities can work together. Just last year, the Colorado River Cooperative Agreement was signed between Denver Water and Western Slope water providers and municipalities. The agreement is a long-term partnership that aims to achieve better environmental health in the Colorado River Basin, as well as high-quality recreational use. The agreement, which included 43 parties from Grand Junction to Denver, states that future water projects on the Colorado River will be accomplished through cooperation, not confrontation. It’s debatable whether that will happen, given the finger-pointing cropping up during the draft stages of the Colorado Water Plan process. James Eklund, director of the Colorado Water Conservation Board and head of the development of the Colorado Water Plan, believes it can happen, but he admits it won’t be easy. But positions like Loff’s that are 100 percent against more transmountain diversion projects are widespread on this side of the Continental Divide, and it’s going to take more than some conversations and a few handshakes to find some middle ground. So that will be part of the process in the coming months as each of the nine basins drafting implementation plans polish up their drafts before sending them off to the state. Two of the Front Range basins, Metro and South Platte, are combining theirs into one document, for a total of eight plans being rolled into the Colorado Water Plan. It’s like a community development plan that lays out a vision and direction, but it will require execution, said Jim Pokrandt, communications and education director for the Colorado River District.